Note: When I wrote this post, NYTimes Cooking was available without charge to anyone who wanted to use it, but as of now, October 20, 2018, you either have to subscribe to it as a stand-alone feature or subscribe to the NYTimes. As a long-time reader of the NYTimes, I find NYTimes Cooking to be a treasure trove of recipes, and I enthusiastically recommend it to anyone willing to listen. The site is user-friendly; it's easy to save recipes, print recipes, share recipes, and email recipes. Since its inception I have added a number of its recipes to my own repertoire. 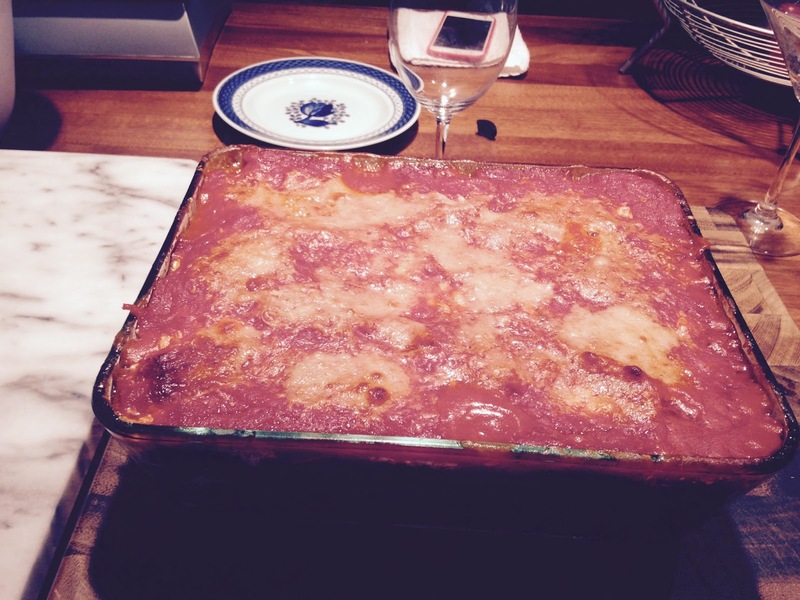 Melissa Clark wrote a piece for the NYTimes called Parmigiana Dishes to Warm Weary Souls. It's definitely worth your time to read it if you have access to it. Melissa Clark uses panko when she makes Parmesan dishes. I use 4C plain unseasoned panko when I fry eggplant to serve unadorned with dinner. However, I have only used to use plain dried breadcrumbs when I make this dish. Perhaps I will try it with panko sometime, but so far I have not done so. This is not the Eggplant Parmesan you would make if you were using Marcella Hazan's recipe in Essentials of Classic Italian Cooking or eating in Italy. It is a version of Eggplant Parmesan most likely attributable to the Italian-American immigrants who arrived in America in large numbers between the 1880's and the 1920's. My own grandmother was born in 1897 in her family's apartment at 193 Mott Street, New York City. She was the youngest of eight children, and the first to be born here, making her the first natural-born American in my family as my mother was from England. "Nanny" was a good cook and made fried eggplant often, but I don't remember her ever making eggplant parmesan. Homemade manicotti, yes; eggplant parmesan, no. Either make the Simple Tomato Sauce and let it cool before proceeding with layering the ingredients, or make it ahead. Beat 6 eggs and put them through a medium-coarse, not very fine, strainer into a small bowl. Don’t skip this step; it makes the egg very silky so the breadcrumbs adhere smoothly to the eggplant. It's a small thing that makes a big difference. At the moment Bed, Bath & Beyond has a set of three strainers, which I like very much, with the right size mesh. They are made by a brand called Salt. I use the middle one to strain the eggs for this dish. Wash and dry the eggplant; don't peel it. Cut the eggplant into slices about ⅓-inch thick or a little thicker. Set up your station to bread the eggplant - one plate with Wondra, one plate with the beaten and strained eggs, one plate with plain dried breadcrumbs. Liberally season the flour with salt and pepper, and stir with a fork to mix thoroughly. Coat the eggplant first with the Wondra, then with the eggs, and finally with the breadcrumbs, setting the breaded pieces of eggplant on a platter as you go along. When the eggplant pieces are all coated, shallow fry them in vegetable oil until golden-brown on each side. Make sure your oil is hot enough to keep them from getting soggy, but be careful not to burn them. Place each piece of browned eggplant on another platter as you go along until all of the eggplant is done. Grate the mozzarella on the large holes of a hand-held box grater. I use a Microplane Box Grater; the large holes are "cupped," and make easy work of grating the cheese. Put the grated mozzarella on a plate. Grate the Parmesan cheese. Put it on another plate. Assemble everything within easy reach - the sauce, the two cheeses (each on a separate plate), and the platter of eggplant. Take a casserole 3-inches deep - I use a Pyrex 11-cup casserole (easy to find in the grocery store) - and butter it. Then add in this order (1) a thin layer of sauce, (2) a sprinkling of Parmesan cheese, (3) slices of eggplant, (4) grated mozzarella, and start over again. Do as many layers as will fit in the casserole, ending with sauce and Parmesan cheese. Do not end with mozzarella. By the time I am done, I have used all of the sauce and all of the mozzarella. Bake in a preheated 350-degree oven for 40 minutes or until the eggplant is bubbling all the way through. Let rest at room temperature for ten minutes before cutting to serve.